Putin has signaled his support for a proposal made by two Russian lawmakers to send a delegation to Washington. Secretary of State John Kerry told ABC News on Sunday that the administration had offered Russians a briefing on its intelligence assessment. On Friday 30 August, Secretary of State John Kerry laid out a wealth of unclassified information showcasing the involvement of Assad’s regime in the massacres, and highlighting the US moral obligation to act. The following day, President Obama spoke with his usual eloquence, outlining the moral imperative of demonstrating to the Syrian regime (and other regimes that may harbour similar thoughts of using weapons of mass destruction) that its actions would not be condoned. President Obama did, however, indicate that he intended to first seek and obtain support from the American people through their representatives in Congress. Interestingly, and in my view erroneously, a variety of pundits, analysts and leaders in the Middle East think this decision reflects inherent weakness in the president. The University of Nebraska at Omaha recently hosted a workshop on the “Arab Spring”, with one of the world’s foremost experts on Syria, Professor Joshua Landis, whose website Syria Comment is arguably one of the best sources for accurate and up-to-date information and analysis of the situation in Syria. Destroy the dictators and promote democracy? Mind our business and stay away? Intervene selectively and according to varying rationales, depending on the circumstances? Each of these choices tears us apart. They also involve derivative trouble, sprouting two heads for every one severed, like the Hydra. Taking out the military dictators invites chaos and disorder, tribal conflict, death and destruction. Democracy falls in the hands of thugs, or worse yet, religious hardliners, who are hell bent on imposing the law of God, as told in the Quran, in the way they interpret it. Doing nothing against them passes a message of weakness and invites trouble from all sorts of aspiring tyrants, troublemakers and killers. And selective intervention, that precious asset of open, thinking society is looking more like vacillation, making those who practice it sound self-important, foolish and confused. Damned if you do, damned if you don’t, damned if you think you can sit back and think about it for a while. I watched several news channels early this morning, one of which included Lavarov saying that the evidence shown by the Americans wasn’t convincing and then he listed that it didn’t have latitude and longitude coordinates, etc. (roughly paraphrased) but I noticed he was lying. And, that seems odd. Why lie about it? If your entire foreign policy is to deny the existence of whatever happened simply to vote no in the security council halls at the UN – why bother? Just say that no matter what atrocity is done by a government head and / or its military, you agree with them doing that. Or, simply say, “look – we are going to vote no – regardless, no matter what.” That solves as good without getting on news broadcasts and pretending to be a responsible member of the international community concerned with diplomatic and foreign affairs while remarkably lying about the evidence you’ve seen on the situation. This isn’t about Russia and China vetoing any resolution by the UN Security Council that may be made condemning the use of chemical weapons by the Syrian government, but it will become that. There is no point in a UN Security Council if it and its participants can’t be counted on to say a situation is wrong when it is wrong. The newspaper also said the dossier itemized around 1,000 tons of chemical weapons making Syria the site of one of the largest such arsenals in the world. A government source said top lawmakers would be given “evidence of different kinds that will allow the regime to be clearly identified as responsible for the August 21 chemical attack”. The Syrian chemical program revolves around the Center of Studies and Scientific Research (CERS). [It] is primarily responsible for the production of toxic warfare agents. Its 450 branch is responsible for filling operations ammunition chemicals, but also the security of the sites and chemical stocks. Composed solely of Alawite military, this unit is characterized by a high loyalty to the regime. Bashar al-Assad and some of the most influential members of his clan are sole authority to order the use of chemical weapons. The order is then sent to the heads of the relevant branches of the ESRB. In parallel, the staff of the armed receives the order and decide targets, weapons and toxic to implement. NATO Secretary-General Anders Fogh Rasmussen said on Monday that “a firm international response” was needed to the alleged chemical weapons attack in east Damascus. “We believe that these unspeakable actions which claimed the lives of hundreds of men, women and children cannot be ignored,” Rasmussen told a news conference in Brussels. “It would send, I would say, a dangerous signal to dictators all over the world if we stand idly by and don’t react,” he said. Rasmussen added that he saw no further role for NATO in the Syria crisis, beyond defending Turkey. A total of 14 attempted purchases by Syria were turned down since 1998 by Switzerland’s export-control watchdog, the State Secretariat for Economic Affairs, its spokeswoman Marie Avet said. Among the contested items were a bioreactor, an industrial vacuum pump, and valves. On Monday Mr Ayrault made public France’s nine-page report into the incident, drawn up by military and foreign intelligence services. The use of chemical weapons can only be authorised by President Assad or “certain influential members of his clan”, says the report, while opposition forces lack the capacity to carry out such a large-scale chemical attack. In Iraq, starting in 2006, Chemical Ali went on trial for mass murder and other crimes against humanity. The proceedings were undeniably flawed. Yet they put Majid’s murderous arrogance on full display to his countrymen, and guaranteed that the record of his guilt can never be obscured. He was hanged in 2010. The prospect of even such rough justice for Syria’s chemical bombers looks elusive. Yet Obama’s original instincts were sound. There are red lines even in a war as devoid of clarity as Syria’s. The best available evidence is that on August 21st Bashar al-Assad’s forces crossed to the other side. Russia is one of Assad’s biggest arms suppliers and has a naval maintenance facility in the Syrian port of Tartous. Moscow opposes any military intervention in Syria and has shielded Damascus from pressure at the UN security council. Interfax said the Priazovye would be operating separately from a navy unit permanently stationed in the Mediterranean in a deployment that the Russian president, Vladimir Putin, said is needed to protect national security interests. In a letter to the business secretary, Vince Cable, to be sent on Monday, a member of the House of Commons’ committee on arms export controls will demand to know who was allowed to sell the chemicals and what other licences for the export of dangerous materials to Syria have been granted. Commenting on the reports, which were first published in the Sunday Mail, Labour’s shadow business secretary, Chuka Umunna MP, said: “The chair of the joint intelligence committee confirmed last week that their assessment was that the Syrian regime had used lethal chemical weapons on 14 occasions from 2012. There are, therefore, very serious questions to answer as to why, in January 2012, export licences for chemicals to Syria which could be used in the manufacture of chemical weapons were approved. In addition, Russia’s only Mediterranean naval base for its Black Sea Fleet is located in the Syrian port of Tartus. Early in 2012, Russia took a strong stand in support of Syria’s government and against international action—promoted by Western and Arab countries—to punish the government for its crackdown on the Syrian uprising. As one of five veto-wielding members of UN Security Council, Russia promised to veto any sanctions against the Syrian government put before the Security Council and continued supplying large amounts of arms that Syria had earlier contracted to buy. The Syrian port city of Tartus hosts a Soviet-era naval supply and maintenance base, under a 1971 agreement with Syria. The base was established during the Cold War to support the Soviet Navy’s fleet in the Mediterranean Sea. Since Russia forgave Syria of three-fourths, or $9.8 billion, of its $13.4 billion Soviet-era debt and became its main arms supplier, Russia and Syria have conducted talks about allowing Russia to develop and enlarge its naval base, so that Russia can strengthen its naval presence in the Mediterranean. Amid Russia’s deteriorating relations with the West, because of the 2008 South Ossetia War and plans to deploy a US missile defense shield in Poland, President Assad agreed to the port’s conversion into a permanent Middle East base for Russia’s nuclear-armed warships. Since 2009, Russia has been renovating the Tartus naval base and dredging the port to allow access for its larger naval vessels. Syria for the past few years has reached out to Russia to obtain modern weapons that included many modern anti-tank and anti-air missile systems that will further improve its combat capabilities. In 2008, Syria agreed to purchase MiG-29SMT fighters, Pantsir S1E air-defense systems, Iskander tactical missile systems, Yak-130 aircraft, and two Amur-1650 submarines from Russia. Russia’s foreign minister said his country’s sale of weapons to Syria would not upset the balance of power in the Middle East. The sales he stated are “in line with the international law” and “in the interests of strengthening stability and maintaining security” in regions close to Russian borders, Sergei Lavrov told reporters during a visit to the United Nations in New York. As of 2011, Syria’s arms contracts with Russia were worth at least $4 billion. Dmitri Trenin reports in the New York Times that from 2000 to 2010 Russia sold around $1.5 billion worth of arms to Syria, making Damascus Moscow’s seventh-largest client. Tartus is the last Russian military facility outside the former Soviet Union, and its only Mediterranean repair and replenishment spot, sparing Russia’s warships the trip back to their Black Sea bases through the Turkish Straits. In late November 2011, Pravda and Reuters announced that a naval flotilla led by the aircraft carrier Kuznetsov was on its way to the naval facility in Tartus as a show of support for the al-Assad government. In the same report, the Russian Navy said that a visit to its support facility in Tartus had nothing to do with the events in Syria. On 3 August 2012 international media reported that three large Russian amphibious assault ships, carrying hundreds of marines would soon visit the port of Tartus in Syria. Earlier reports, quoting a source at the Russian General Staff, said the ships would spend a few days in Tartus and would take on fresh supplies of food and water. British media added that the ships each had up to 120 marines on board. The Russian defence ministry left open the possibility that the ships might dock there at some point for logistical reasons, saying they had every right to do so. The General Staff source, who was not named, had said that after calling in at Tartus they would head for the Bosphorus and the Russian Black Sea port of Novorossiysk. The ships, part of Russia’s Northern Fleet, are the Aleksandr Otrakovskiy, the Georgiy Pobedonosets and the Kondopoga, all Ropucha class landing ships. The source, quoted by Interfax news agency, said one would anchor off Tartus and the other two would use a floating dock, because the port facilities were limited. There is speculation that Russia may begin evacuating its nationals from Syria and deploy marines to protect personnel and equipment, as the violence intensifies. Some 30,000 Russian citizens live in Syria, according to the New York Times and Financial Times. As of mid-January 2013 there have been no reports of the Russian Navy either actually landing any naval infantry in Tartus or evacuating any Russian citizens using naval vessels. The evacuation of approximately 80 citizens via Beirut on 23 January 13 has been reported. As of May 2013, Russia has sent a dozen or more warships to patrol waters near its naval facility. According to Russia Today, on 26 June 2013 Russian Deputy Minister of Foreign Affairs Bogdanov reported that the facility does not have any strategic military importance and that Russia decided to evacuate all civilian and military personnel from Tartus . This information was denied by Russian Defense Ministry on 27 June 2013. It was announced through a ministerial statement that “Tartus is still the official base for Russian ships in the Mediterranean and continues to carry out the tasks in the fulfillment of its missions”. Russia has sent a dozen or more warships to patrol waters near its naval base in Syria, a buildup that U.S. and European officials see as a newly aggressive stance meant partly to warn the West and Israel not to intervene in Syria’s bloody civil war. Russia’s expanded presence in the eastern Mediterranean, which began attracting U.S. officials’ notice three months ago, represents one of its largest sustained naval deployments since the Cold War. He said that about 1,000 Russian citizens living in Syria wanted to leave the country. Mr Lavrov said Russia had pulled out the families of diplomats, but there were no immediate plans to reduce embassy staff. The flights were provided by Russia’s emergencies ministry, and Russian media said doctors and psychologists were aboard. Meanwhile, Turkey has called for humanitarian access to Syrian cities, warning that about three million people do not have shelter, water or food. More than 60,000 people are believed to have died in the 22-month-old uprising against President Assad. “‘Chemical weapons’ use in Syria, whoever has done it, is a criminal action and must be condemned. This is Iran’s clear and absolute position,” Iranian Foreign Affairs Minister Mohammad Javad Zarif wrote on his Facebook page. “Did all those countries, which make a lot of noise today, have the same position when Saddam Hussein killed many civilians by chemical bombs in [the Iranian town of] Sardasht?” Mr Zarif added on his Facebook wall. Sardasht, a small town in the Iranian province of West Azerbaijan, was the first place where civilians were attacked with chemical weapons by the then Iraqi President Saddam Hussein during the Iran-Iraq War some 25 years ago. On 28 June 1987, Iraqi aircrafts dropped mustard gas bombs on Sardasht in two separate attacks on four residential areas. Sarin, the deadly nerve gas that the United States says was unleashed last month by the Syrian regime in a Damascus suburb, was developed by Nazi scientists in 1938. On Sunday, U.S. Secretary of State John Kerry said Washington has proof the regime of President Bashar Assad used sarin, a lethal nerve gas that kills in minutes developed by Nazi scientists in 1938. France said Sunday it will soon declassify secret defense documents detailing Syria’s chemical arsenal in defiance of international conventions. A government source made the comment after the Journal du Dimanche weekly said French intelligence agents had compiled information showing that some of the weapons had been stockpiled for nearly 30 years. The arsenal included over 1,000 tons of chemical agents, the paper said. According to the Sunday newspaper, the arsenal included sarin and mustard gas. The secret documents showed that Syrian scientists had also worked to develop a powerful agent that was far more toxic that sarin. two Romeo class submarines (inactive). Syria has received another batch of SS-N-26 Yakhont anti-ship cruise missiles from Russia. Syria had ordered the missiles in 2007 in a deal worth about $300 million and deliveries from Russia began in 2011. The supersonic and sea-skimming Yakhont is the export version of the domestic 3M-55 Oniks (Onyx) developed by Russia’s NPO Mashinostroyeniya. Russia has been asked to stop arms deliveries to Syria, including the S-300PMU2 air-to-surface missiles. Russia had in the past suspended some deliveries, such as the Syrian purchase of MiG-29M fighter aircraft. NATO Secretary-General Anders Fogh Rasmussen (pictured above) did not beat around the bush at a press conference in Brussels on Monday (02.09.2013). In his view there is no doubt that Syrian president, Bashar al-Assad, let hundreds of innocent Syrians be killed in a poison gas attack on August 21. “Personally, I am not only convinced that the chemical weapons attack occurred, but also that the regime in Syria was responsible,” Rasmussen told journalists. Without going into detail, Rasmussen said he had seen intelligence information that left no other conclusion. A small, Kyrgyzstan-based airline is helping Tehran “move suspected illicit cargo” to support Bashar al-Assad’s bloody crackdown in Syria, the US Treasury Department says. KTA was designated pursuant to E.O. 13224 for providing financial, material, or technological support for, or financial or other services to Mahan Air, by leasing aircraft to Mahan Air. KTA has been publicly identified as an umbrella company purposely established for importing aircraft to Iran. In this regard, between 2009 and 2010, KTA acted as an intermediary for Mahan Air’s acquisition of eight aircraft, all of which are now identified by Treasury as blocked property operated by Mahan Air. Some of the aircraft supplied by KTA to Mahan Air are used, interchangeably, to move suspected illicit cargo to the Syrian regime and provide civilian passenger flights to Europe and Asia. The U.S. Department of the Treasury today designated the terrorist group Hizballah for providing support to the Government of Syria, pursuant to Executive Order (E.O.) 13582, which targets the Government of Syria and its supporters. This action highlights Hizballah’s activities within Syria and its integral role in the continued violence the Assad regime is inflicting on the Syrian population. In addition to the actions taken against the IRGC-QF and Qasem Soleimani in 2011 under E.O. 13572, the United States has repeatedly exposed Iran’s support for the ongoing violence perpetrated by the Syrian government. the LEF also dispatched personnel to Damascus to assist the Syrian government in its efforts to suppress the Syrian people. In February 2012, Treasury designated the Iranian Ministry of Intelligence and Security, Iran’s primary intelligence organization, for providing substantial technical assistance to the Syrian GID. With actions such as today’s designation, Treasury will continue to expose Iran’s provision of support to the Government of Syria as well as its continued support of Hizballah’s activities within Syria and throughout the region. and Supreme Leader Ayatollah Ali Khamenei-confidante Mehdi Taeb said that Syria is Iran’s “35th province…if we lose Syria we won’t be able to hold Tehran.” Without Iranian military aide and financial largesse, al-Assad’s regime may have fallen long ago. While Iran’s major role in Syria is undeniable, it is impossible to discern Tehran’s precise financial and military assistance to the al-Assad regime. According to official estimates, Iran’s annual trade with Syria is only around $700 million per year, which is less than half of its trade with Afghanistan and a small fraction of its $30 billion trade with China. This figure, however, does not take into account the subsidized oil Iran has provided Syria since 1982, when Damascus agreed to close Iraq’s oil pipeline through Syrian territory. A lot of people are asking why we should go to war in Syria and don’t seem to understand that the question isn’t about going to war at all. Syria’s government leaders, decision-makers and generals have chosen genocide, mass murder and the use of chemical weapons and other military grade munitions for use on their own populations. That is unacceptable. It is against all of the conventions, treaties and agreements among nations that have been written and signed by the international community. It isn’t about “fixing” Syria. It isn’t about “solving the Syria question”. It isn’t about going to war again in the Middle East nor with Syria. This is about what we choose to do as a nation and as conscientious international citizens in the face of a military choice by a government to turn those weapons on their own people and to use chemical weapons on their own population to decimate them in the most horrific way possible. It is unconscionable. It is against international law. It defies the efforts and goals of even its closest Middle Eastern neighbors. It puts everyone in countries around them at risk and exhibits a wanton disregard for the agreements against those acts which have been made by the full international community. No one wants these weapons on their doorstep. Chemical weapons used on any part of a nation’s own population is a horrific statement of, and about, what the leadership and generals holding access to those weapons believe they have a right to do. It is a fact that they have already done this. It isn’t open to question. It is a fact that the Syrian government have stockpiles of these weapons which they have refused to give up to UN weapons inspectors to be dismantled and disposed of safely. It is a fact that the government and military generals of Syria have been and continue to use the most malicious and sadistic means possible to quell any voices that do not agree with them, including those of even the smallest children who have no way to pick up any arms against them. It didn’t matter. They were killed in their own beds using chemicals made to cause the greatest suffering and the greatest number of deaths. It wasn’t an accident. It was intentional, intended, planned and executed with complete disregard. It doesn’t get more profound than this – statement from someone speaking on tele news program. And so it is. It is the most profound question because of this – Do we stand by and do nothing when a leader and his advisers, military generals and resources in a member nation of the international community chooses genocide, intentionally causes horrific suffering, uses chemical weapons and mass murders as domestic policy? The U.S. government said it has “high confidence” that Syria’s government carried out a chemical weapons attack — killing 1,429 people, including at least 426 children. Berlin has called for the international community to take a “clear position” following the alleged chemical attack, but has left open what exactly that might entail. Although Russia says that they will not stand for a resolution nor for action in the UN Security Council – the truth is, Putin and the Russian government, Russian generals and ministers do not get to perpetrate mass murder and inundate their population with chemical weapons to “dispose” of people who disagree with them. They don’t do that anymore because it isn’t acceptable, they’ve agreed not to do it and it doesn’t make good sense to do those things. Those things are criminal. They are wrong. This is exactly why the UN Security Council was created. Not to stand idly by while a major country starts obliterating its people and threatens its neighbors, but rather to resolve these issues by authority. The people in the government of Syria including its leadership and its generals who made these decisions to annihilate the people of Syria with chemical weapons and military equipment not intended for that use – must be brought to justice to answer for these crimes. They can be arrested by the United Nations Security Council. They are not sovereigns. Syria itself may be sovereign as a territory but its leadership is not. They are responsible to the same laws as everyone else and should in fact be even more so because of the power they wield and the position of trust that they have. To have abused that power in such a lucid and intentional manner must be held to account. It cannot be ignored. It cannot be diplomaticized away. It cannot be set aside because of other questions concerning Syria. It must be answered unequivocally, specifically and in a way that sends a profound signal to any who would ever try to do such a thing again which expresses what will occur as a result. As a result of public outrage, the Geneva Protocol, which prohibited the use of chemical weapons in warfare, was signed in 1925. While a welcome step, the Protocol had a number of significant shortcomings, including the fact that it did not prohibit the development, production or stockpiling of chemical weapons. Also problematic was the fact that many States that ratified the Protocol reserved the right to use prohibited weapons against States that were not party to the Protocol or as retaliation in kind if chemical weapons were used against them. Poison gasses were used during World War II in Nazi concentration camps and in Asia, although chemical weapons were not used on European battlefields. But since the end of World War II, chemical weapons have reportedly been used in only a few cases, notably by Iraq in the 1980s against the Islamic Republic of Iran. After 12 years of negotiations, the Chemical Weapons Convention (CWC) was adopted by the Conference on Disarmament in Geneva on 3 September 1992. The Chemical Weapons Convention allows for the stringent verification of compliance by State Parties. The Chemical Weapons Convention opened for signature in Paris on 13 January 1993 and entered into force on 29 April 1997. On 28 June 2013 the Chemical Weapons Convention entered into force for Somalia, making it the 189th State Party to the treaty. Somalia had earlier deposited its instrument of accession with the Secretary-General of the United Nations, on 29 May, and 30 days later the Convention entered into force for the country. This has reduced to seven the number of States that have not yet joined. Read more. So, there isn’t one nation like the UK or even the US or France that is responsible for this Prohibition Against Chemical Weapons Use – there are 189 signatories to it meaning, 189 nations including their leaders and their citizens that Syria’s government and military leaders must answer to for having used these weapons on their own people. And, there is the International Criminal Court they must answer to for having done it as well. And, then those leaders can rot in a jail cell for having done it which is much better than anything they deserve. And, if it isn’t already obvious – those people need those kinds of weapons taken out of their reach and away from their access entirely. Obviously. Satellite image provider DigitalGlobe Inc. released photos Friday that appear to show Syrian army tanks and other armored vehicles in the city of Homs. Syrian forces tanks shelled apartment buildings in the city of Homs where military defectors were thought to be hiding and three civilians were killed, activists said Saturday. Residents said tanks fired anti-aircraft guns to hit ground targets as well as machine guns in the old district of Bab Amro, according to Reuters. Last month, Russia reportedly signed a $550 million deal to sell combat jets to Syria. Mohammed Saleh, a Syria-based activist, said the regime appears to be trying to take over rebel-held areas in Homs and Idlib before Feb. 17, when Assad’s ruling Baath party is scheduled to hold its first general conference since 2005. The conference is expected to move on reforms that Assad has promised in a bid to calm the uprising. During the conference, Baath party leaders are expected to call for national dialogue and announce they will open the way for other political parties to play a bigger role in Syria’s politics. The Putin-Bandar meeting was stormy, replete with warnings of a “dramatic turn” in Syria. (the meeting was three weeks before the Syrian government’s massive use of chemical weapons killed 1429 people, including 426 children on Aug. 28). The Chemical Weapons Convention (CWC) is the most recent arms control agreement with the force of International law. Its full name is the Convention on the Prohibition of the Development, Production, Stockpiling and Use of Chemical Weapons and on their Destruction. This agreement outlaws the production, stockpiling and use of chemical weapons. It is administered by the Organisation for the Prohibition of Chemical Weapons (OPCW), an independent organization based in The Hague. The OPCW administers the terms of the CWC to 188 signatories (now 189), which represents 98% of the global population. Russia entered the CWC with the largest declared stockpile of chemical weapons. By 2010 the country had destroyed 18,241 tonnes at destruction facilities located in Gorny (Saratov Oblast) and Kambarka (Udmurt Republic)—where operations have finished—and Shchuchye (Kurgan Oblast), Maradykovsky (Kirov Oblast), Leonidovka (Penza Oblast) while installations are under construction in Pochep (Bryansk Oblast) and Kizner (Udmurt Republic). Syria is one of only 7 states which are not party to the Chemical Weapons Convention. However, it is party to the 1925 Geneva Protocol prohibiting the use of chemical weapons in war but has nothing to say about production, storage or transfer. Independent assessments indicate that Syrian production could be up to a combined total of a few hundred tons of chemical agent per year. Syria reportedly manufactures Sarin, Tabun, VX, and mustard gas types of chemical weapons. In July 2007, a Syrian arms depot exploded, killing at least 15 Syrians. Jane’s Defence Weekly, a U.S. magazine reporting on military and corporate affairs, believed that the explosion happened when Iranian and Syrian military personnel attempted to fit a Scud missile with a mustard gas warhead. Syria stated that the blast was accidental and not chemical related. On July 13, 2012, the Syrian government moved its stockpile to an undisclosed location. In September 2012, information emerged that the Syrian military had begun chemical weapons tests and was reinforcing and resupplying a base housing these weapons located east of Aleppo in August. On March 19, 2013, news emerged from Syria indicating the first use of chemical weapons since the beginning of the Syrian uprising. On August 21, 2013, testimony and photographic evidence emerged from Syria indicating a large-scale chemical weapons attack on Ghouta, a populated urban center. The Rotterdam Convention (formally, the Rotterdam Convention on the Prior Informed Consent Procedure for Certain Hazardous Chemicals and Pesticides in International Trade) is a multilateral treaty to promote shared responsibilities in relation to importation of hazardous chemicals. The convention promotes open exchange of information and calls on exporters of hazardous chemicals to use proper labeling, include directions on safe handling, and inform purchasers of any known restrictions or bans. Signatory nations can decide whether to allow or ban the importation of chemicals listed in the treaty, and exporting countries are obliged make sure that producers within their jurisdiction comply. The sixth meeting of the Rotterdam Conference was held from 28 April to 10 May 2013 in Geneva, Switzerland. Observers say the targets of last Friday’s attacks may have been two preachers known for their opposition to the Syrian government and its Lebanese ally, Hezbollah. Following the US sanctions announcement in 2007, he told the BBC that the designation was tantamount to “a medal we hang on our chest”, and was part of a “political ploy aimed at undermining important individuals”. President Assad is reported to have been angered by an interview Mr Makhlouf gave to the New York Times in May 2011, in which he said the government would fight “until the end” and that it would “not suffer alone”. In May 2011, Gen Qudsiya was included in a list of Syrian officials subjected to EU sanctions for their roles in violence against protesters. Military Intelligence is said to have played a prominent role in the crackdown, firing on crowds of protesters and killing a large number of civilians. Hezbollah stopped and detained Saudi nationals riding in a car with diplomatic plates in southern Beirut this week, reported Asharq al-Awsat on Saturday. That is the same Hezbollah who has sent its members to “help” the Syrian government fix things and soldiers to support the government’s efforts to wipe the populations of dissent out of existence. Assad and others of his regime, family members in positions of power, military generals, security and intelligence agency leaders have Alewite connection. This wikipedia map shows where that is, but other maps make it clear that other resources go through that territory too. Port, railroads, petrol? etc. US Secretary of State John Kerry has accused Syrian government forces of killing 1,429 people in a chemical weapons attack in Damascus last week. He highlighted evidence in the assessment that regime forces had spent three days in eastern Damascus preparing for the attack. “We know rockets came only from regime-controlled areas and landed only in opposition-held areas,” he said. The British Guardian reported that a mediator – a well-known diplomatic figure –acting of behalf of Syrian President Bashar Assad approached former Israeli Foreign Minister Avigdor Lieberman with a request that Israel not block attempts to form an Alawite state, which could have meant moving some displaced communities into the Golan Heights area. All property records for Homs were destroyed in a fire earlier this month at the office of the city’s land registry and residents fear they can no longer enforce a claim to their land and homes. Homs and the surrounding province is seen as essential to the war in Syria and to any plan to create a safe haven for Alawites if the Syrian state collapses, as it geographically links largely Alawite areas on the Syrian coast and Shiia areas in Lebanon’s Bekaa Valley. The Federation of Arab Republics (Arabic: اتحاد الجمهوريات العربية Ittiħād Al-Jumhūriyyāt Al-`Arabiyya) was an attempt by Libya‘s Muammar Gaddafi to merge Libya, Egypt and Syria in order to create a United Arab state. Although approved by a referendum in each country on 1 September 1971, the three countries disagreed on the specific terms of the merger. The federation lasted from 1 January 1972 to 19 November 1977. It is not to be confused with the United Arab Republic (1958–1961), which was a single sovereign state uniting Egypt and Syria. Growing disagreements between the civilian Baathists, such as Aflaq, and the party’s Military Committee, led by young officers such as Assad [Bashar al Assad’s father], caused a split in the pan-Arab movement. Aflaq’s supporters were forced from the Baath Party leadership. They found refuge in Iraq, where the Baath Party returned to power in a coup in July 1968. The Iraqi Baathists elected a new pan-Arab leadership, which included Saddam Hussein and Aflaq. It was first the regional branch of the original Ba’ath Party (1947–1966) before it changed its allegiance to the Syrian-led Ba’ath movement (1966–present) following the 1966 split within the original Ba’ath Party. The party has ruled Syria continuously since the 1963 Syrian coup d’état which brought the Ba’athists to power. The Ba’ath party functions as Syria’s dominant party. The Alawite State (Arabic: دولة جبل العلويين‎, Dawlat Ǧabal al-ʿAlawiyyīn), known in French as Alaouites and named after the locally dominant Alawite sect of Shi’a, was a French mandate territory in the coastal area of present-day Syria after World War I. The French Mandate, from the League of Nations, lasted from 1920 until 1946. Use of the term ‘Alawite’ instead of ‘Nusayri’ was advocated by the French early in the Mandate period and referred to a member of the Alawi religious sect. The region the French named the “Alawite Territory” in 1920 came to be home to a large population of Alawi Muslims. The region was both coastal, mountainous and home to a predominantly rural, highly heterogeneous population. During the French Mandate period, the society was divided by religion and geography: the landowning families in the port city of Latakia and 80% of the population of the city were Sunni Muslim. However, more than 90% of the population of the province was rural, 62% being Alawite peasantry. The southern border was with Lebanon, the northern border with the Sanjak of Alexandretta where Alawites made up a large portion of the population. To the west was the Mediterranean coast. The border to the east with Syria was roughly along the An-Nusayriyah Mountains and the Orontes River running from north to south. Modern-day Latakia Governorate and Tartus Governorate roughly encompass what was the Alawite State, both governorates having majority Alawite populations; however, parts of modern-day Al-Suqaylabiyah District, Masyaf District, Talkalakh District and Jisr ash-Shugur District (now in neighboring governorates) also belonged to it. 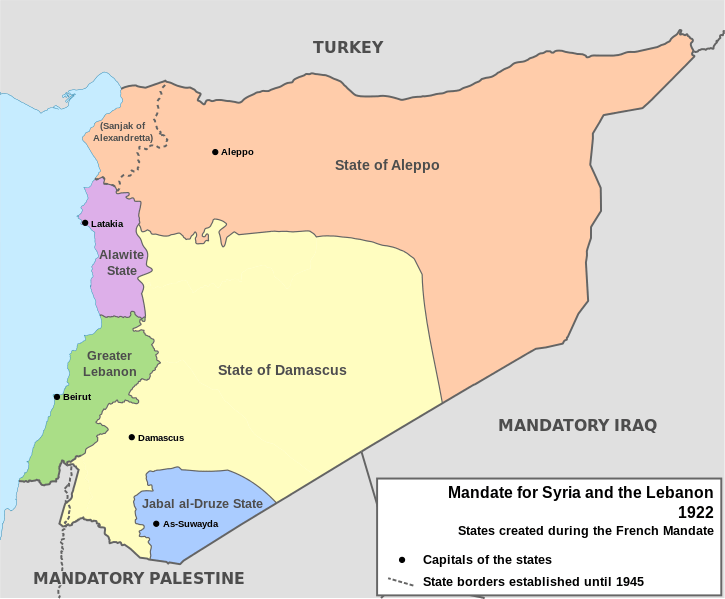 At the time, native outcry for unification of Syria met with rejection; in early September, 1920, the French divided the territories of their mandate based on heterogeneous population, in an effort to grant ‘local autonomy’ to demographic regions. On 2 September 1920 a ‘Territory of the Alawis’ was created in the coastal and mountain country comprising Alawi villages; the French justified this separation with the ‘backwardness’ of the mountain-dwelling people, religiously distinct from the surrounding Sunni population. It was a division meant to protect the Alawi people from more powerful majorities. The French departed Syria in 1946. The new independent government lasted three years until a military coup in 1949. 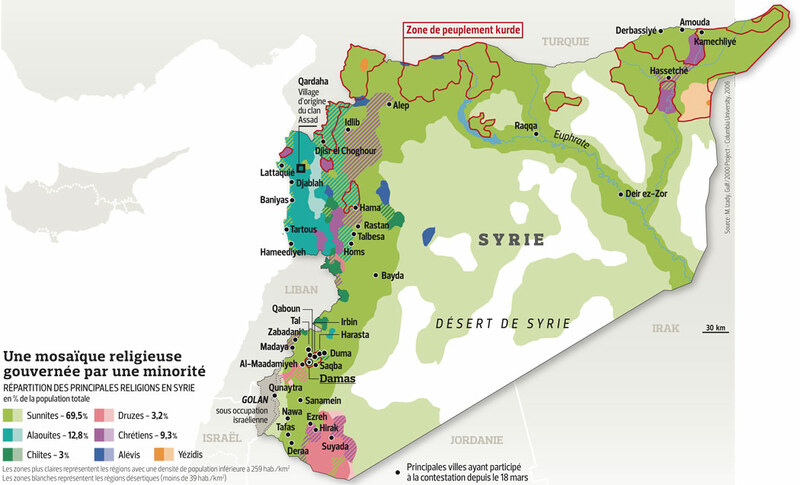 The Syrian Army was dominated by recruits from Alawite, Druze, and rural Sunni communities, a composition from the earlier French Mandate times. After 1949 and the coup, Alawites came to dominate the military officer positions and government positions in the 1960s. The former President, Hafez Asad, and his son Bashar, the current President, are of Alawite descent. As the Syrian civil war progresses, there has been widespread speculation that there will be reprisals against the Alawites, leading to speculation of a re-creation of the Alawite State as a safe haven for Assad and the leaders should Damascus finally fall. King Abdullah II of Jordan has called this scenario the “worst case” for the conflict, fearing a domino effect of fragmentation of the country along sectarian lines with consequences to the wider region. The above video, uploaded on Saturday to YouTube, appears to show a Syrian army anti-aircraft tank firing wildly into an urban neighborhood in the city of Douma, just outside of Damascus. The Assad regime has come under increasing international recrimination for its use of massive deadly force against civilian opposition forces and army defectors. The death toll after nearly a year of protests is presently estimated at between 5,400 and 7,000. The Defense Department estimates Syria has 50 chemical arsenal and manufacturing facilities, which are supplemented by additional research institutions and storage depots. “Syria probably has one of the largest programs in the world,” said Leonard Spector, deputy director of the James Martin Center for Nonproliferation Studies. “It has multiple types of chemical agents,” he said, including nerve agents, chlorine and phosgene. Open source information going back to the 1980s indicates Syria has four chemical agent manufacturing plants at al-Safira, Hama, Homs and Latakia. Two chemical munition storage sites are also believed to be located at Khan Abu Shamat and Furqlus, according to previous reporting. The search for non-naval oil routes is not a new topic. In 2003, shortly after the invasion of Iraq, the Pentagon requested a feasibility study on the possible revival of the long-defunct Mosul-Haifa oil pipeline route. This pipeline was activated by the British in 1935 to transfer Iraqi oil to the Mediterranean. It was shut down in 1948 by Iraq in the aftermath of Israel’s founding. However, properly secured, a pipeline through Israel, Syria or Lebanon to the Mediterranean would be of tremendous value. The important phrase here is “properly secured”. Otherwise, one choke point would be exchanged for another, potentially more vulnerable one. Although there are pipelines through Syria today, they are of miniscule importance compared to major arteries such as Egypt’s SUMED and would do little to replace the Strait of Hormuz-Suez route. For decades, the Assad regime effectively locked itself out of any meaningful commercial links with the West through a combination of wars, dark alliances and support for terror groups across the region. During the Lebanese Civil War, Syria actively supported Shi’ite factions and came to dominate Lebanon in the aftermath of the country’s civil war. Furthermore, the country harbored Imad Mugniyeh, the prime suspect in the 1983 bombing of a US Marine Corps barracks in Beirut, in which nearly 300 US and French servicemen were killed. He was finally assassinated in 2008, in Damascus. After the Cold War, Syria continued to dominate Lebanon, and was allegedly a key player in the assassination of president Rafic Hariri, a Sunni. Though this led to the “Cedar Revolution” that drove most of Syria’s uniformed troops out of Lebanon and loosened its grip on the country, Syria’s continued support of terror organizations in Lebanon and the political wing of Hezbollah kept it at odds with the West. Hopes that Bashar al-Assad would initiate a new era of peace and openness with the West were dashed early on. He sheltered a number of key leaders from Saddam Hussein’s Ba’athist Party, and did almost nothing to stem the flow of money, fighters and weapons back into Iraq. Meanwhile, Shell continues to drill and pump oil out of the wells that surround Mayadin, Burhama and Deir Az-Zour itself. Operating in this region in a context of full-scale uprising and military occupation means that Shell – through its joint venture Al-Furat Petroleum – must be co-ordinating closely with the Syrian military. Despite talk of imminent EU sanctions, Shell is preparing to export more crude from Syria. Preparations are set for Damascus to start auctioning exploration rights for development of offshore oil reserves, the Syrian oil minister said. Italian energy company Eni, French supermajor Total and China National Petroleum Corp. were among the 10 foreign companies that submitted bids to develop Syria’s offshore reserves last year. The minister said Damascus wants to keep production stable at around 386,000 barrels of crude per day with the help of the new foreign investments. Three blocks, covering more than 1,900 square miles, will go to auction. So, when were the sanctions taking effect? Yeah, right. But I thought I would look it up. As of October 2012, the direct and indirect costs of war to the Syrian oil industry stood at approximately $2.9 billion, according to statements made by Syria’s Minister of Petroleum and Mineral Resources. A large portion of this total reflects the loss of Syria’s oil exports, which have been limited by escalating sanctions by the United States, European Union, and others. Additionally, domestic energy infrastructure—such as railway networks, oil pipelines, and refineries—is frequently the target of attacks, leaving many areas of the country without access to vital petroleum products. 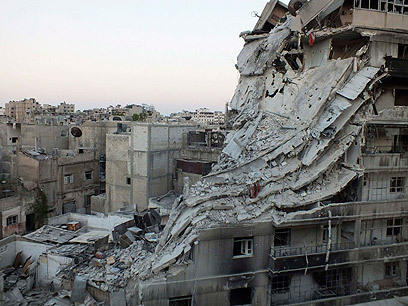 According to the Syrian government, damage to the country’s energy infrastructure totaled approximately $220 million through the end of October 2012. Of that total, the electricity sector accounts for the majority of damage ($146 million), while damage to oil infrastructure amounted to more than $70 million. Regionally, the continued violence threatens to derail Syria’s ambitions of becoming an important energy transit country to its neighbors, the Mediterranean, and Europe. President Bashar Assad calls his vision the Four Seas Strategy to link the Mediterranean, the Caspian Sea, the Black Sea and the Persian Gulf into an energy network. To get the ball rolling, Ankara and Damascus plan to integrate their gas grids and link them with the Arab Gas Pipeline that starts in Egypt and serves Jordan, Syria, Lebanon and Turkey. Plans to build a new AGP link between Syria and Turkey were signed in 2009, with completion expected this year. “Assad’s enlarged vision of Syria’s role as a strategic energy transiting role is to link the nation’s oil and gas pipeline network to the Nabucco pipeline that will carry oil from the Caspian Sea to Turkey and on to Europe,” Brooks observed. Syria’s exports of crude oil and petroleum products were severely restricted in 2012 as a result of sanctions. In the 12 months prior to the onset of protests in March 2011, approximately 99 percent of Syria’s crude exports went to Europe (including Turkey) according to trade data available to EIA. In 2012, only four cargoes were loaded, none of which went to European markets. Further exacerbating the effects of decreased European imports is the fact that Syria’s heavy crudes require specific refining capabilities not found in all potential destination markets, thereby limiting the potential alternatives available for exports. Because the majority of Syria’s oil exports previously went to European countries (which possess the ability to process Syrian grades), the current market for Syrian crude is extremely limited, but there are some countries still willing to take Syrian crude. According to several news outlets, Syria and Russia agreed to swap 33,000 bbl/d of Syria’s crude oil in exchange for gasoline and diesel fuel. This arrangement comes on the heels of shipments from Iran, Iraq, Malaysia, and Venezuela of much-needed petroleum products, although—unlike the barter deal with Russia—those deals were monetized. The ongoing conflict diminishes Syria’s production—and possibly refining—capacity, and heating oil (known in Syria as mazut) and diesel fuel are two of the products in short supply. Iraq agreed to send up to 720,000 tons of fuel oil to Syria as part of a one-year supply contract signed in June 2012, and Iran agreed in early 2012 to supply Syria with 900,000 tons per year of liquefied petroleum gas (LPG). Both of these arrangements—as well as the deal with Russia and others with Venezuela—help close the supply gap created by the sanctions, but even with lowered demand in Syria shortfalls are likely to persist. Syria has three export terminals on the Mediterranean, all of which are operated by the Syrian Company for Oil Transport (SCOT) under the GORDPP. Syria exports two crude oil blends, Syrian Light and Syrian Heavy (also known as Souedieh) through Sytrol, the state-owned marketing company. Since the sanctions on Syria’s oil sector came into full effect, total exports have fallen significantly, and they are not expected to rebound until there is a cessation of hostilities in the country. In an interview with Russian press, Mr Putin said that Russia-China co-operation would produce “a more just world order”. Russia and China both demonstrated a “balanced and pragmatic approach” to international crises, he said. The United States Geological Survey (USGS) released a report that the Levant Basin contains an estimated 1.8 billion barrels of recoverable oil and an estimated 122 trillion cubic feet of natural gas. The Levant Basin lies both onshore and offshore and includes most of middle and northern Israel and coastal Lebanon and Syria. Most of the Levant Basin lies within the land and territorial water of Israel. BBC has Arab League press conference right now – legal intervention for crimes against humanity. Talking about specific accountability for those who caused the chemical weapons and mass murder in Syrian government. As for Syria’s chemical weapons here our most urgent goal is to ensure, for humanitarian reasons, that these weapons are not used in the current conflict. As the Obama Administration reiterated yesterday, Assad has been warned not to take this step, which would certainly lead to calls for military intervention against him that even Moscow would find hard to oppose. Our second goal with respect to Syria’s chemical weapons, of course, is to ensure that positive control over these weapons is maintained and that chemical agent and munitions are not transferred to others. Readily transported chemically-armed artillery shells would be the easiest to divert and could be used by Hezbollah or another group possessing standard artillery pieces of the type found in Syria’s armory. There is a degree of panic, and rightly so, over whether the Syrian tyrant Bashar al Assad will use chemical weapons against either his own people or foreign attackers. His regime has this week threatened to do the latter, thus finally confirming what was long suspected but never openly admitted, that Syria possesses chemical weapons. No-one in the western media seems remotely curious about how Syria has managed to arm itself to the teeth with them beneath the radar of international scrutiny. Dr Danny Shoham, at the Begin-Sadat Centre for Strategic Studies at Bar-Ilan University in Israel, is an expert in chemical and biological warfare. In a Middle East Quarterly article in 2002,Guile, Gas and Germs: Syria’s Ultimate Weapons, he set out the extraordinary history of Syria’s chemical weapons programme. These areas to the south-west of city have been decimated by battles between rebel groups and the Syrian army, according to research by Channel 4 News. The target is reported to be the Mazeh military airport – which is linked to a nuclear facility where chemical weapons are also stored. Videos on social media sites also claim to show victims of chemical weapons in Adra, a town several miles north-west of Damascus. The town is adjacent to a large industrial facility and is, according to Channel 4 News, close to “vast chemical weapons storage facilities and missile bases”. Syria has benefited from cooperation with the USSR then Russia, Iran, China, and North Korea, but has also procured equipment and chemical products from western firms. It is believed to still be dependent on precursors, “preprecursors”, and dual-use technology imports. Iran is thought to be its main supplier, but it may also acquire them through bogus companies linked to the Syrian Scientific Research Council (SSCR, also known as the Scientific Studies and Research Centre). Established in 1971 in Damascus and officially in charge of promoting scientific research and civilian technology, the SSCR is the main entity implicated in the Syrian chemical weapons programme. The Higher Institute of Applied Science and Technology (HIAST) is believed to train engineers affiliated to the SSCR. These two entities have been targets of US sanction since 2007, in the scope of Executive Order 13382. Several production sites are thought to have been identified near to Aleppo (Al-Safir site), Homs, Hama, and Latakia. The two principal storage sites are believed to be located to the east of Damascus and near to Homs, at Khan Abou Shamat and Furqlus respectively, but other sites are thought to be distributed throughout the country. Last May, the European Union imposed penalties on Syria, including freezing President Bashar al-Assad’s assets and preventing him from obtaining visas. In May, Switzerland said it would impose a travel ban on 13 Syrian officials and freeze any assets they have in Swiss banks as a reaction to the violent campaign launched by the government against protestors, advocates of reform, in which more than 1,300 civilians were killed, thousands of others injured, and about 15 thousand arrested. In August 2011, President Obama announced new sanctions against companies and figures in the Assad regime that barred U.S. citizens and firms from dealing with them. The sanctions were announced the same week that the European Union imposed an embargo of Syrian oil. But the Assad family, often referred to in the country as a “mafia,” has more than 40 years in power established control over much of Syria’s domestic corporations and large businesses that are relatively unaffected by sanctions. Besides controlling most of Syria’s national wealth, which runs into hundreds of billions of dollars, the family’s personal assets could equal more than $1 billion, Willis says. A look at the players in the Assad family regime. Maher Assad — Brother of Bashar Assad. Age 44. Leader of the Republican Guard, commander of the Syrian Army’s Fourth Armored Division. Driving force behind the violent repression of protests. USGS – The Mineral Industry of Syria report – May 2013 pub. Israel’s weekend airstrike on a military complex near the Syrian capital of Damascus killed at least 42 Syrian soldiers, a group of anti-regime activists said Monday, citing information from military hospitals. Israel launched a rare airstrike inside Syria on Wednesday, US officials said. The US said the target was a truck convoy. It was believed to be carrying anti-aircraft weapons bound for Hezbollah in neighbouring Lebanon, an arch foe of Israel. However the Syrian military denied the existence of any such weapons shipment and said a scientific research facility outside Damascus was hit by the Israeli warplanes. It said the target was in the area of Jamraya, northwest of Damascus and about 10 miles from the Lebanon border. His difficulty has nothing to do with intercontinental ballistic nuclear missiles—and everything to do with natural gas that’s cooled to -260F at normal pressure, condensed into liquid form, and transported on special tankers to markets around the world. America’s surprising return as an energy superpower is complicating life for the Russian petro state. The rise of a vibrant, global, and pipeline-free liquefied natural gas (LNG) market is a direct threat to Russia’s interests in Europe, where Gazprom, the state-owned energy giant, supplies about 25 percent of the gas. So is the shift in pricing power from suppliers to consumers as a result of the huge supply shock emanating from North America. “What some outside observers fail to realise is that the Alawites, having run a very tough police state for 40 years, simply cannot afford to lose power,” he said. Syrian president Bashar al-Assad is not a dictator – just a figurehead – according to a former British ambassador to Syria. Syrian president Bashar Assad and his family are living on a warship guarded by the Russian navy, it has been claimed. The embattled dictator is said to have moved with his family and a select band of aides to the warship off Syria’s coast. The move, which is said to have come about after the president lost confidence in his own security detail, sees Assad travel by helicopter to Damascus to attend meetings in his presidential palace. The head of the U.N. refugee agency in Syria says 7 million Syrians, or almost one-third of the population, have been displaced by the country’s civil war. Tarik Kurdi told The Associated Press on Monday that 5 million of the displaced are still in Syria while about 2 million have fled to neighboring countries. He says 2 million children are among those directly affected by the war. Russia has remained an ally of the regime since the popular uprising in March 2011, during which time the UN estimates more than 60,000 people have been killed. Russia also endorsed a speech by Assad last week where he offered an end to the crisis by calling national elections and forming a new government. Considering that genocide and use of chemical weapons on his nation’s people was chosen instead of the promised end to the crisis by calling national elections and forming a new government – well, that promise made over and over by the Assad regime was apparently a lie. The roughly 23 million inhabitants of Syria are an overall indigenous Levantine people. While modern-day Syrians are commonly described as Arabs by virtue of their modern-day language and bonds to Arab culture and history, they are, in fact, largely a blend of the various Semitic speaking groups indigenous to the region. During colonial years, the region had a fairly large minority of French settlers. Many of them stepped out after the recognition of Syrian independence, but their influence is still evident on fluency of French by the educated class in Syria. Syria’s population is 74% Sunni Muslim, Other Muslims (including Alawites and Druze) make up 16% of the population, Various Christian denominations make up 10% and finally, a few Jewish communities in Aleppo and Damascus. 1,500 people of Greek descent live in Syria. The majority of them are Syrian citizens. Arabic is the official, and most widely spoken, language. Arabic speakers, including some 500,000 Palestinians, make up 85% of the population. Many educated Syrians also speak English and French. The Kurds, many of whom speak Kurdish, make up 9%  of the population and live mostly in the northeast corner of Syria, though sizable Kurdish communities live in most major Syrian cities as well. Armenian and Turkmen are spoken among the small Armenian and Turkmen populations respectively. Neo-Aramaic is still used by Assyrians and in some villages in the Anti-Lebanon mountains. Sixty percent of the population live in the province of Aleppo, the Euphrates valley or along the coastal plain; a fertile strip between the coastal mountains and the desert. Overall population density is about 118.3/km² (306.5 per sq. mi.) Education is free and compulsory from ages 6 to 11. Schooling consists of 6 years of primary education followed by a 3-year general or vocational training period and a 3-year academic or vocational program. The second 3-year period of academic training is required for university admission. Total enrollment at post-secondary schools is over 150,000. The literacy rate of Syrians aged 15 and older is 86.0% for males and 73.6% for females. The Chemical Weapons Convention (CWC) is an arms control agreement which outlaws the production, stockpiling, and use of chemical weapons. Its full name is the Convention on the Prohibition of the Development, Production, Stockpiling and Use of Chemical Weapons and on their Destruction. The agreement is administered by the Organisation for the Prohibition of Chemical Weapons (OPCW), which is an independent organization based in the Hague, in the Netherlands. The main obligation under the convention is the prohibition of use and production of chemical weapons, as well as the destruction of all chemical weapons. The destruction activities are verified by the OPCW. As of January 2013, around 78% of the (declared) stockpile of chemical weapons has thus been destroyed. The convention also has provisions for systematic evaluation of chemical and military plants, as well as for investigations of allegations of use and production of chemical weapons based on intelligence of other state parties. As of June 2013, 189 states are party to the CWC, and another two countries (Israel and Myanmar) have signed but not yet ratified the convention. One Islamic Jihad member was killed and 10 people wounded when an Israeli tank opened fire east of Gaza City on Wednesday. Also Wednesday a seven-year-old child was killed and two other people were wounded in an explosion apparently set off by accident and which also badly damaged a home in the southern Gaza city of Khan Younis, witnesses said. via Israel bombs Gaza Strip | RFI.